Do back belts reduce spinal loads? Do back belts weaken core muscles? Do back belts improve posture and body mechanics? Are back belts a good safety reminder? While we know back belts do something, we are not certain what the benefits of that "something" are. If you have a back injury, a back belt may ease your pain and provide a sense of support. However, there is no evidence that a back belt can prevent further injury. Not all back belts (a.k.a. "abdominal belt" or "back support) are the same. There are more than 70 types of back belts. The typical support is a lightweight, elastic belt worn around the lower back, sometimes held in place with suspenders. Other back belts are quite rigid. Different back belts can have different outcomes. 1. Do back belts prevent injury? Most experts say "No." Back belts do not eliminate exposure to hazard. During lifting activities there are forces on the spine and on the supporting muscle groups whether or not a back belt is used. There are a many causes of back injury and all of these must be addressed to reduce back injuries. It is possible that a back belt can increase injury risk in some cases. 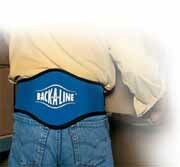 Back injury rates are highest among users who wear a back belt then discontinue its use. The reasons for this are unknown. 2. Do back belts reduce spinal loads? This is a controversial topic. Some experts believe back belts increase abdominal pressure (IAP) and thereby decrease compressive forces on the intervertebral discs. However, there is no direct evidence of this, and no one knows whether this has any effect on risk of injury. 3. Do back belts weaken core muscles? Some believe that back belts prevent stomach protrusion and thereby force the abdominal muscles to remain inward while contracting, facilitating them to contract more efficiently. This has not been proven. It is possible the lifting structures of the back weaken with prolonged use of a back belt. In one study, a rigid weight-training belt reduced back extensor muscle activity. However, is not known whether this can lead to muscle weakness if the belt was worn for long periods. More research is needed. 4. Do back belts improve posture and body mechanics? Most experts say, "No." Many believe that back belts align the spine to preserve good lifting postures. In fact, there is little or no change in vertebral alignment during lifting with use of a back belt. Most industrial back supports and sports belts have no effect on lumbar motion, velocity, or posture. Some rigid belts, especially those with an anatomically-shaped lumbar insert (like our Back-A-Line) can alter movement patterns. The effect of these altered movement patterns appears to improve the wearers body mechanics (i.e., moving in a safe way), but some experts warn that if movement is reduced in one area, forces could be transferred to other unsupported regions and lead to increased injury there. 5. Are back belts a good safety reminder? Some believe a back belt increases worker awareness regarding lifting and therefore decreases the likelihood of risky lifting behaviour. However, many experts fear this can lead to “Superman Syndrome,” when wearers have a false sense of security and take additional risks. People who suffer a back injury while wearing a back belt have the most severe injuries; their injury severity is greater than people who never wore a back belt and suffer a back injury. The reasons for this are unknown. A back belt alone will not reduce your risk of back injury. To avoid injury you should use sound ergonomic principles, proper body mechanics, and attempt only those tasks within your physical capabilities. Use your back belt together with a "total" health and safety program. Wear your back belt as much as necessary and as little as possible. Use it to lift heavy objects and remove or loosen it when not lifting. Do not use a back belt to increase your load lifting limit. Maintain good physical conditioning (strength and flexibility). Make sure your belt is comfortable and fits your size and shape. Back Belts: Do They Prevent Injury? NIOSH Publication No. 94-127, Oct. 1996. Back Belts: No “Support” from The Surgeon General or DoD. DoD Ergonomics Working Group, Issue 39, January 2005.